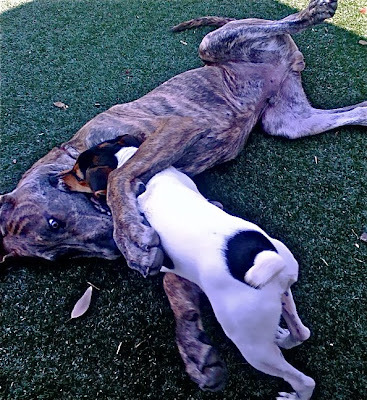 Roman goes to the dog park every Tuesday and Wednesday for a play date with Turbo, a Jack Russell Terrier. Roman tries to keep up with Turbo for about 10 minutes before he gets worn out, then Roman usually stands there while Turbo nibbles on him, once he finally gets tired of being a standing chew toy he throws Turbo to the ground and they wrestle for a while. This picture just doesn't do justice in showing you how much of a difference in size there is between the two. Roman weighs about 70 lbs and Turbo weighs about 10. They play so well together. It's so nice to have someone else wear Roman out for the day. Thanks Turbo! Wow your dog is gorgeous...just don't tell him I said that!! HOly cow I can't believe how big Roman got so fast! You guys are brave to have a big dog like that.